and to quell the aspirations of their social inferiors. Their values, their mode of life, and their technology reflect this intimate association between nobility and violence. The paradigmatic medieval warrior was the armored knight: a man trained since childhood to fight in armor on horseback. His principal weapons were the lance and sword. Skirmishing with bows or other missiles he viewed with contempt, for only in close hand-to-hand combat could he display his prowess, that murderous combination of courage, strength and skill that his culture most prized. His body was encased in armor: first, in mail of interwoven forged metal rings; then, after around 1300, in plates of high-grade steel. His training, mount, and equipment represented a massive investment of economic and social capital that could not be lightly thrown away, so every possible effort was made to preserve his life despite the inherent dangers of his occupation. The knight was a man superbly integrated into his own characteristic technological complex, a lethal synthesis of armor, weapons, horse, and martial skills. How this complex emerged, however, is the subject of an interesting debate. Back in 1962, an outstanding historian of technology, Lynn White Jr., published a series of essays in famous book, Medieval Technology and Social Change. In it, he argued that medieval society had evolved in response to a series of technological innovations in war, agriculture, and industry. Among professional historians, White’s arguments have been mostly discredited, mainly because we tend to privilege the role of culture in history and resist what can be seen as determinism. Nonetheless, White’s arguments remain powerful, and retain many supporters.1 White contended that when the stirrup was introduced to Europe sometime in the eighth century, it provided horsemen a fighting platform sufficiently stable for the development of the first true shock cavalry —mounted knights. White believed that Charlemagne’s grandfather, Charles Martel, had realized what was going on and fielded an army of these new and improved warriors who would become the basis for future Carolingian power. To pay for them—and they were expensive—he granted them land pried from the Church under the condition that they maintain their horses and weapons, and come to fight whenever the army was mustered. And thus, for White, feudalism was born. On the surface, this is a persuasive argument; but, unfortunately, it seems most likely wrong. First of all, the dates do not work out as White expected; second, he seems to have very much overstated the importance of stirrups to effective cavalry.2 Rather, it seems likely that Charlemagne himself began to place an increased emphasis upon cavalry, whose mobility was a great benefit within a sprawling empire, and who were ideally suited to the “rapid response” and “search and destroy” missions his policies demanded.3 When his empire and royal authority began to collapse after his death, aristocratic warrior horsemen came to dominate the local landscape, achieving the social dominance they would enjoy until the end of the middle ages. To do this, however, required one further element: castles. The Normans (that is, “the North Men”) represented here on the famous Bayeux Tapestry, were the descendants of Scandinavian Vikings and their families, who settled in Northern France. They readily adopted the religion, language, customs, and technologies, while retaining the ferocity of their forebears. This, along with their mastery of knight and castle technology, enabled Normans to conquer vast territories in Europe, including Sicily and most of Southern Italy in addition to the conquests in the British Isle, and overseas during the crusades. 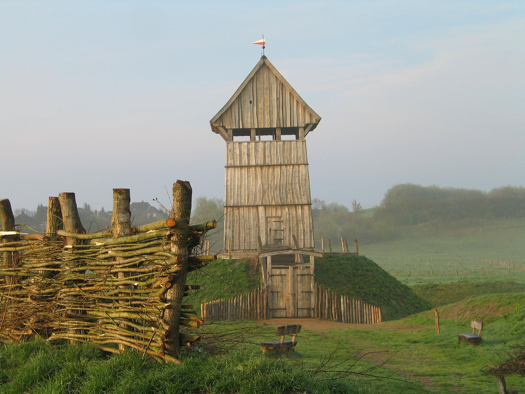 A modern reconstruction of the motte – the mound and tower – of a motte and bailey castle. Wood and earth castles can, or course, be burned and leveled, and they suffer the effects of neglect rapidly, and for these reasons by the 11th-C., the wealthiest and most powerful aristocrats were instead building castles of stone. Over time, castles designs became progressively more elaborate. Crusaders adopted many of the principles of sophisticated Byzantine military architecture and applied them to their own castle construction, and brought back what they learned to Europe. So effective were these structures that conquering territory supplied with castles and resolute defenders became all but impossible. 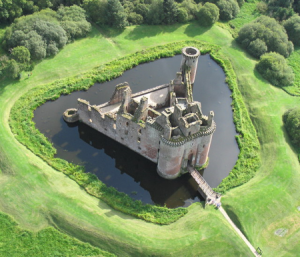 Caerlaverock Castle, a thirteenth century Scottish castle that shows the increasing sophistication of medieval military architecture in the high middle ages. Not that medieval warlords did not routinely make the effort, and nowhere, perhaps, is the openness and flexibility of the medieval mind toward technological innovation on greater display than at the castle walls. Armies experimented with siege towers and various kinds of battering rams. Miners dug tunnels under castle walls to undermine them (which is why castles were often built on solid rock or at least surrounded with a moat). 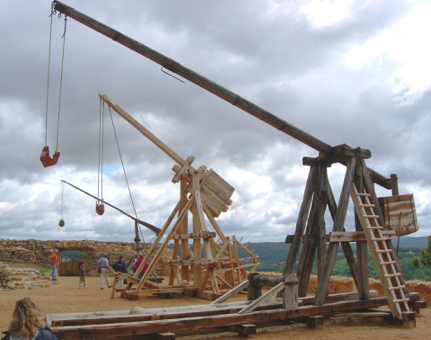 Engineers built huge stone throwing machines to batter down castle walls. The best of these was the trebuchet, a device that like so many medieval innovations originated in China, but was redesigned in Europe to deal with high castle walls. Modern reconstructions of medieval trebuchets. A trebuchet is basically a giant lever: a long tapering beam pivots on an offset fulcrum. A sling was attached to the long end of the beam; a massive weight, often of many tons, hung from the short broad end. Men used ropes to lower the long end to the ground, hoisting the weight into the air. A boulder, weighing between 100 and 300 lbs. was then loaded in the sling, and then when the weight fell the sling arm flew up releasing the stone that could fly some 300 yards. The English king Edward I used a battery of giant trebuchets to destroy the walls of several Scottish castles.9 Nonetheless, walls usually did not come down so easily, and when all was said and done, the only sure fire way to capture a castle was to starve its defenders into submission, an undertaking that could sometimes take years. 1 For a balanced summary of the (almost) current state of White’s theses, see Alex Roland, “Once More Into the Stirrups: Lynn White Jr., Medieval Technology and Social Change,” Technology and Culture 44.3 (2003): 574-585. 2 See Stephen Morillo, “The “Age of Cavalry” Revisited,” in L. Andrew Villalon and Donald J. Kagay, eds., The Circle of War in the Middle Ages: Essays on Medieval Military and Naval History (Boydell, 1999): 45-58. 3 Bernard S. Bachrach, “Charlemagne’s Cavalry: Myth and Reality,” Military Affairs 47.4 (1983): 181-187. 4 Kelly DeVries and Robert Douglas Smith, Medieval Military Technology, 2nd ed. (Toronto: University of Toronto Press, 2012), 197-198. 6 From the Vita Geraldi, quoted in T.N. Bisson, “The Feudal Revolution,” Past and Present 142 (1994): 6-42; 16. The argument presented in this chapter is derived in large part from Bisson’s, but see also the ensuing debate: Dominique Barthélemy and Stephen D. White, “The Feudal Revolution,” Past and Present 152 (1996): 196-223; Timothy Reuter and Chris Wickham, “The Feudal Revolution,” Past and Present 155 (1997): 177-208; and finally Bisson’s response, “The Feudal Revolution: Reply,” Past and Present 155 (1997): 208-225. 7 DeVries and Smith, 213-217. 8 For a discussion of the evolution of castle construction and design, see DeVries and Smith, 212-259. 9 Ibid., 128; for siege equipment generally, see Ibid., 165-181, and for trebuchets and artillery, 115-136. 10 This argument is from John Stone, “Technology, Society, and the Infantry Revolution of the Fourteenth Century,” The Journal of Military History 68.2 (2004): 361-380.